Although there are multiple FIRST robotics teams in our school district, many of the schools do not support robotics, including the middle school we attended. This year, there is a new principal at the middle school, so we decided that we should give a demo to him. He invited a few other principals in the district as well as technology staff. 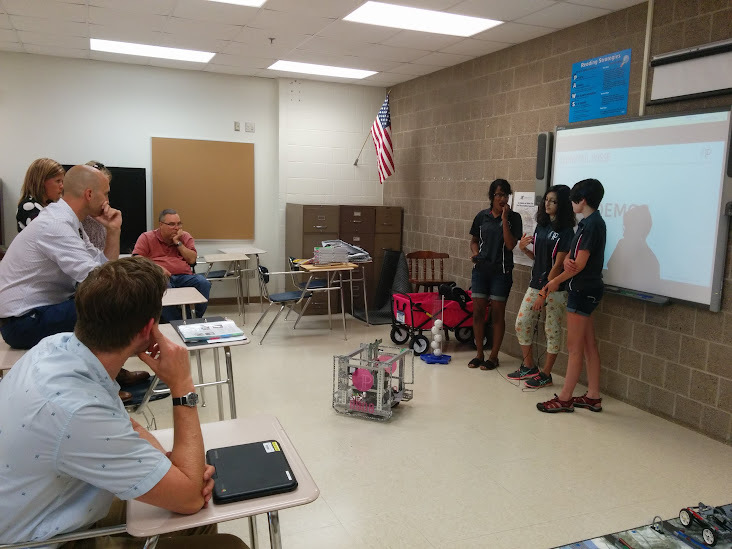 We gave a slide presentation about FIRST, FLL, and FTC and had a robot demonstration afterwards, which showed the new technology. By the end of our presentation, they were very interested and spent a lot of time asking about details of implementing this into the school system. This specific presentation was very important to us, because once we graduated from elementary school, we no longer had school support to fund things like the robot kit and tournament registration. There have been several unacknowledged top teams that came from middle and high schools around the district. We not only wanted to propose the idea of introducing school support for FLL and FTC; we wanted to inform the district about FIRST in general. Once they see how valuable FIRST can be to students, it will be promoted in the schools and more future robotics kids will be interested in joining.